Call today for a customized workplace solution! Providing fully furnished executive office space, conference rooms and virtual office solutions, you’ll enjoy the environment and amenities at Connecticut Business Centers. We’re committed to helping you achieve your greatest potential, and our highly trained staff will make you and your clients feel welcome. Be productive in our beautiful, comfortable executive offices with full-time reception, cafés, and convenient parking. Host a board meeting, a small group session, or a videoconference in our conference facilities. Our locations are equipped with superior high-speed Internet access to help you achieve business excellence. Set up a virtual office using our street addresses and have your mail and phone calls forwarded to you. You can rent an office by the hour, when you need it! Whether you’re an entrepreneur, own a small business, or head up a small local team for a large corporation, we offer a customized, turnkey workspace. Need a full-time office suite, a temporary office, or a shared office that will fit more than one person? 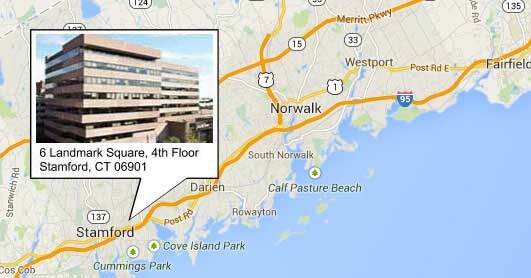 Our Stamford CT office space can help with your needs. Connecticut Business Centers’ experienced team is here to help your business thrive. From answering calls and greeting guests to helping you prepare that important presentation, our friendly staff is ready to assist you. We consider our staff members our greatest asset and our clients agree! Our clients love the convenience to the Stamford Town Center – whether it’s a quick lunch or a get-together after work, you’re in the heart of it all. To tour or get more information about our Stamford office space, simply complete the form on this page or contact us directly at (203) 359-5600, and we will have you up and running within two business days.